Thanksgiving is around the corner again and you need to make it as memorable, fun and exciting as possible. It is a period of sharing, cooking, having friends around and making the best of the relationship you have. Apart from the regular sitting around the dining, eating turkey and sharing beers with your friends and family, why not do something different this year; something unique and memorable? You might be wondering about what it is that can make your thanksgiving more memorable. Well, why not consider Thanksgiving Limo Service in Long Island, New York? You are probably wondering why limo service? Of course, luxurious limo transportation service is becoming more widespread and popular every year. The thanksgiving weekend is usually a fun packed period with different traditions and events lined up. To make your movement round the city more seamless, using a limousine service will be a great idea. So why do you need Limo Service for Thanksgiving in Long Island, New York? As mentioned earlier, there are different events that usually take place during the holiday weekend and knowing how to enjoy each of the days and events is the essence of this article. Thanksgiving Eve is usually a self- announcer. You do not really need any special reminder to that it is here. This is majorly because the day has developed to become one of the largest party night during the year. With a lot of people out partying, there is also the likelihood of safety and security issues. So why would you want to risk your live or the lives of your friends by being nonchalant about your transportation arrangement. With a great thanksgiving limousine package, you can have a safe and secured limo ride with your friends to any party venue you want to attend. You can definitely arrive at the club or bar in style, not forgetting safely. Yes! Black Friday is one of the high points of thanksgiving. And it is the day you have massive madness on the roads. Why go through all the stress of hopping public transport or taxi to shop when you can arrive at your shopping venue in grand style? With a Thanksgiving & Black Friday Shopping Transportation service, you do not have to worry about the rush hours. Just sit back in the cosy limo and enjoy the ride to your shopping adventure. If you will be entertaining family and friends during thanksgiving then you need to give the transportation requirement a serious thought. You cannot keep your guests in the house all through the holiday weekends. You definitely need to go out hang out in one or two places. How do you go about this? You sure will not think of using public transport to get your guests to attractions of the city. With a Thanksgiving Day Limo Service NYC however, you can be rest assured that your guests will have an awesome time in the city. Whether it is to go on a brewery tour or local winery tour, a limo service is the ideal transportation option for you. You don’t have to stress about traffic as the experienced and professional chauffeur will navigate through the city to get you to your destination. Driving to the airport to pick up guests is really not fun during thanksgiving period. You have many people coming into the city to celebrate with friends and families. Joining the mad rush to pick someone up at the airport is really not worth the stress. So why not use thanksgiving limo buses. With a luxurious limo, you can have a lot of catching up discussion with your guests while you drive all the way from the airport without worrying about traffic or such. 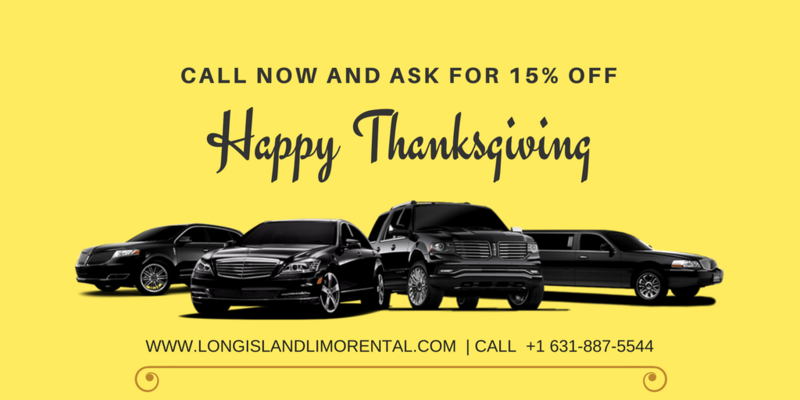 For your Thanksgiving Limo Service in Long Island, New York, Long Island Limo Rental is your best option. Make the best of this thanksgiving with our unique service. For enquiries and booking contact us today.